NZX is at its core a markets business operating equity, debt, derivatives and energy markets. To support the development of its core markets, they provide trading, clearing, settlement, depository and data services. To ensure they are well connected to New Zealand investors, NZX owns Smartshares, New Zealand's only issuer of Exchange Traded Funds, and KiwiSaver provider Superlife. Tasman Empire Airways Limited (TEAL) was the forerunner of Air New Zealand. Trans-Tasman is an adjective used primarily in Australia and New Zealand, which signifies an interrelationship between both countries. Its name originates from the Tasman Sea which lies between the two countries. For example, Trans-Tasman commerce would refer to commerce between these two countries. New Zealand National Airways Corporation, popularly known as NAC, was the national domestic airline of New Zealand from 1947 until 1978 when it amalgamated with New Zealand's international airline, Air New Zealand. The airline was headquartered in Wellington. Australasia comprises Australia, New Zealand, and some neighbouring islands. It is used in a number of different contexts including geopolitically, physiographically, and ecologically where the term covers several slightly different but related regions. 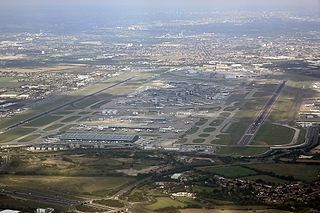 Heathrow Airport, also known as London Heathrow, is a major international airport in London, United Kingdom. Heathrow is the second busiest airport in the world by international passenger traffic, as well as the busiest airport in Europe by passenger traffic, and the seventh busiest airport in the world by total passenger traffic. It is one of six international airports serving Greater London. In 2018, it handled a record 80.1 million passengers, a 2.7% increase from 2017 as well as 480,339 aircraft movements, a 4,715 increase from 2017. The Airbus A320 family consists of short- to medium-range, narrow-body, commercial passenger twin-engine jet airliners manufactured by Airbus. The family includes the A318, A319, A320 and A321, as well as the ACJ business jet. The A320s are also named A320ceo following the introduction of the A320neo. The aircraft family can accommodate up to 236 passengers and has a range of 3,100 to 12,000 km, depending on model. The Airbus A320neo family is a development of the A320 family of narrow-body airliners produced by Airbus. The original family has been renamed A320ceo, for current engine option. Launched on 1 December 2010, it made its first flight on 25 September 2014 and it was introduced by Lufthansa on 25 January 2016. Re-engined with CFM International LEAP-1A or Pratt & Whitney PW1000G engines and with large sharklets, it should be 15% more fuel efficient. The A320neo family is based on the previous A319, A320 and A321. As of February 2019, Airbus has received 6,501 orders and delivered 687 aircraft. The Boeing 777 is a long-range wide-body twin-engine jet airliner developed and manufactured by Boeing Commercial Airplanes. It is the world's largest twinjet and has a typical seating capacity of 314 to 396 passengers, with a range of 5,240 to 8,555 nautical miles. Commonly referred to as the "Triple Seven", its distinguishing features include the large–diameter turbofan engines, long raked wings, six wheels on each main landing gear, fully circular fuselage cross-section, and a blade-shaped tail cone. Developed in consultation with eight major airlines, the 777 was designed to replace older wide-body airliners and bridge the capacity difference between Boeing's 767 and 747. As Boeing's first fly-by-wire airliner, it has computer-mediated controls. It was also the first commercial aircraft to be designed entirely with computer-aided design. A Douglas DC-8 at Sydney Airport in the early 1970s. Air New Zealand was an early operator of the DC-8. Note the pre-1973 livery with the Southern Cross on the tail. An Air New Zealand McDonnell Douglas DC-10 in 1977. DC-10 deliveries began in 1973 and they introduced a new colour scheme, being the first of the airline's aircraft to feature the now-ubiquitous koru logo. The Short Empire was a medium-range four-engined monoplane flying boat, designed and developed by Short Brothers during the 1930s to meet the requirements of the growing commercial airline sector, with a particular emphasis upon its usefulness upon the then-core routes that served the United Kingdom. It was developed and manufactured in parallel with the Short Sunderland maritime patrol bomber, which went on to serve in the Second World War; a further derivative that was later developed was the piggy-back Short Mayo Composite. With the increased range of the Douglas DC-8s the airline's first jet aircraft, Air New Zealand began transpacific services to the United States and Asia with Los Angeles and Honolulu added as destinations in 1965. The airline further acquired wide-body McDonnell Douglas DC-10 airliners in 1973. 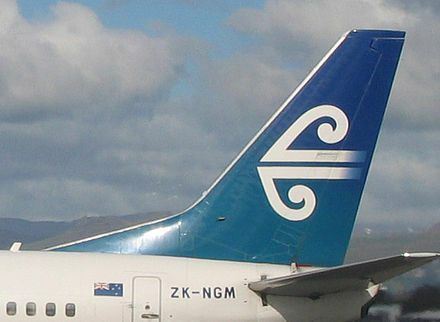 The DC-10s introduced the new koru-inspired logo for the airline, which remains to this day. The Douglas DC-8 is an American four-engine mid- to long-range narrow-body jet airliner built from 1958 to 1972 by the Douglas Aircraft Company. Launched after the competing Boeing 707, the DC-8 nevertheless kept Douglas in a strong position in the airliner market, and remained in production until 1972 when it began to be superseded by larger wide-body designs, including the Boeing 747, McDonnell Douglas DC-10, and Lockheed L-1011 TriStar. The DC-8's design allowed it a slightly larger cargo capacity than the 707 and some re-engined DC-8s are still in use as freighters. The koru is a spiral shape based on the appearance of a new unfurling silver fern frond. It is an integral symbol in Māori art, carving and tattooing, where it symbolises new life, growth, strength and peace. Its shape "conveys the idea of perpetual movement," while the inner coil "suggests returning to the point of origin". In 1981, Air New Zealand introduced its first Boeing 747 airliner, and a year later initiated service to London via Los Angeles. 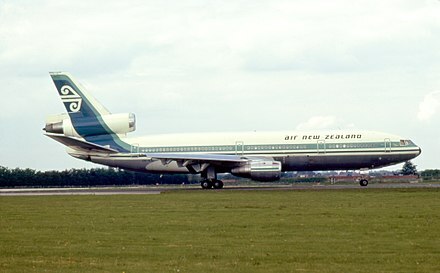 The five 747-200s owned by Air New Zealand were all named after ancestral Maori canoes. 1985 saw the introduction of Boeing 767-200ER airliners to fill the large size gap between the Boeing 737 and 747 (the DC-8 and DC-10 had been withdrawn by 1983). In 1989 the airline was privatised with a sale to a consortium headed by Brierley Investments Ltd.  (with remaining stakes held by Qantas, Japan Airlines, American Airlines, and the New Zealand government). The New Zealand air transport market underwent deregulation in 1990, prompting Air New Zealand to acquire a 50% stake in Ansett Australia in 1995. Air New Zealand added the Boeing 777 to its fleet in 2004. As of 2014, the 777-200ER and the larger -300ER formed the core of the airline's long-haul fleet. In October 2001, Air New Zealand was re-nationalised under a New Zealand government NZ$885 million rescue plan (with the government taking an 82% stake), and subsequently received new leadership. This act was the only thing that spared Air New Zealand from going into administration and likely grounding. In 2002, Air New Zealand reconfigured its domestic operations under a low-cost airline business plan, and the New Zealand government weighed (and later refused) a proposal from Qantas to purchase a one-fifth stake in the carrier. Air New Zealand returned to profitability in 2003, reporting a net profit of $NZ165.7 million for that year. The carrier saw increasing profits through 2004 and 2005. In 2004, the airline announced a comprehensive relaunch of its long-haul product, featuring the introduction of new seats in its business, premium economy, and economy class cabins. In 2011, Air New Zealand introduced the Boeing 777-300ER airliner, as well as the Economy Skycouch, a set of three economy class seats that could be converted into a flat multi-purpose surface by raising the leg rests. After a four-year delay, Air New Zealand took delivery of its first Boeing 787-9 on 9 July 2014. On 12 September 2014, the airline withdrew the Boeing 747 after 33 years of service,  leaving Air New Zealand with a completely twin-engined jet fleet. A Mount Cook Airlines ATR-72-500. Air New Zealand has two wholly owned subsidiary regional airlines – Air Nelson and Mount Cook Airline – that serve secondary destinations in New Zealand. Together they make up Air New Zealand Link. On 26 August 2016 a third wholly owned subsidiary that operated under the Air New Zealand Link brand, Eagle Airways, ceased operations. Air Nelson is based in Nelson, operating Bombardier Q300s. Flight numbers are in the NZ8000 series. Mount Cook Airline is based in Christchurch, operating ATR 72-500 and ATR 72-600 turboprop aircraft. Flight numbers are in the NZ5000 series. On 27 March 2006, Air New Zealand embarked on a changeover to a new brand identity, involving a new Zambesi-designed uniform, new logo, new colour scheme and new look check-in counters and lounges. The new uniforms featured a colour palette mirroring the greenstone, teal, schist and slate hues of New Zealand; sea and sky (a Māori motif created by Derek Lardelli) fabric woven from merino wool; and curves inspired by the airline's logo symbol, the koru. A greenstone colour replaces the blue Pacific Wave colour, inspired by the colour of the pounamu, the prized gemstone found in New Zealand. The Air New Zealand Koru was woven through all Air New Zealand's signage and products. Two new liveries were unveiled. The first is predominantly white with a black strip running downwards on the rear fuselage from the tail, adorned with a koru logo in white, to disappear downwards just aft of the junction of the wings with the fuselage. The black and white fern mark adorns the fuselage. This livery is used on most of the fleet. 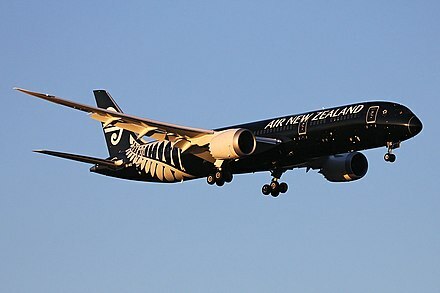 A select number have an all black livery with the fern in silver, including the airline's first Boeing 787-9. Extensive consumer surveys by Air New Zealand revealed 78 percent people believed the Fern Mark fits with the airline's brand and represents New Zealand. The first aircraft to be painted in this livery was rolled out on 24 September 2013. In 1984, pictures of the Buckingham Palace horse guards with 'London, Here We Come' were placed on the side of the hump of the airline's new Boeing 747-200Bs when Air New Zealand was allowed to fly the Los Angeles – London leg of the trans-Pacific route in its own name. 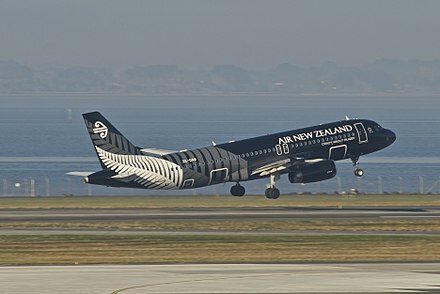 Air New Zealand and its subsidiaries serve 20 domestic destinations and 31 international destinations in nineteen countries and territories across Asia, Europe, North America, South America and Oceania. Air New Zealand serves only five of the domestic destinations; subsidiaries serve the remaining 15 destinations. Air New Zealand operates five fifth freedom routes (i.e. between two non-New Zealand destinations), the most notable being the daily Los Angeles – London Heathrow service, operating as an extension of one of its Auckland – Los Angeles services. 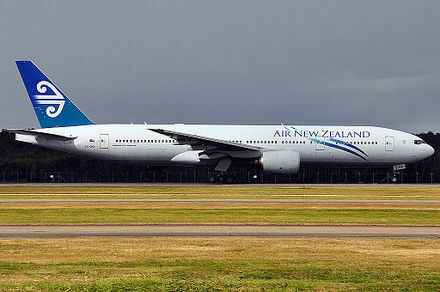 The airline operates weekly flights from Rarotonga to Sydney and Los Angeles, in addition to flights connecting via Auckland. In 2012 – after securing a contract from the Australian government – Air New Zealand launched twice-weekly services from Sydney and Brisbane to Norfolk Island on its A320 aircraft, complementing its existing direct services from Auckland. Air New Zealand's Airbus A320s operate short-haul routes, both domestically and internationally. Air New Zealand was the launch customer for the Boeing 787-9 Dreamliner, shown here landing at its launch destination Perth Airport in Australia; the first was delivered to the airline in July 2014. 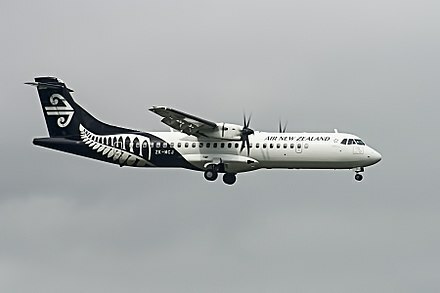 Air New Zealand's subsidiaries operate turboprop aircraft on regional domestic services. Two types of aircraft are used, each belonging to a single subsidiary. Mount Cook Airline operates 27 ATR 72 aircraft between major cities and towns. The 23 Air Nelson-operated Bombardier Q300s operate other routes alongside Mount Cook Airline, including to some smaller centres. A third subsidiary, Eagle Airways, operated smaller turboprops but ceased operations in 2016. On 28 June 2004, Air New Zealand released details of the upgrade to its long-haul product, which was aimed to turn around the profitability of its international services. Every seat on its Boeing 747 aircraft was equipped with a personal LCD screen with audio video on demand (AVOD). First class was removed, with an upgraded business class and a new premium economy section installed. In January 2010, Air New Zealand released details of its new "Kupe" long-haul product for its new 777-300ER aircraft which arrived later that year, as well as on its 787-9 aircraft. Changes included an improved Business Premier and Economy class product, a new Premium Economy cabin, and the introduction of the Economy SkyCouch. Business Premier is the highest available class on Air New Zealand flights, available on both 777 variants and the 787 aircraft. The seating is configured in a herringbone layout in a 1-2-1 configuration on the 777s and 1-1-1 on the 787, allowing direct access for every passenger to an aisle. Each seat is 22 inches (560 mm) wide leather and comes with an ottoman footrest that doubles as a visitor seat. The seat converts to a full length (79.5 in or 2,020 mm) lie-flat bed, for which a pillow, duvet and sheet are provided. Business Premiere cabins can lie flat 6 feet 6 inches i.e. the longest in any airline. 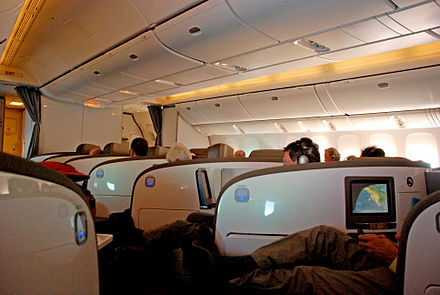 Premium Economy is in a dedicated cabin, which shares lavatories with the Business Premier cabin, available on the Boeing 777-200ER, Boeing 787-9, and some Boeing 777-300ER aircraft. 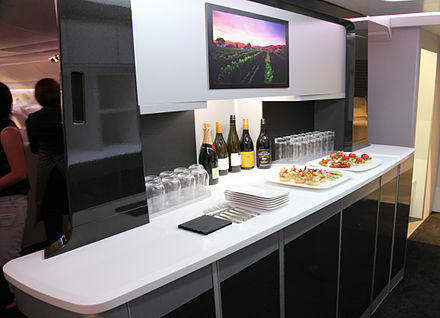 The class has the same mood lighting, dining and wine selection and in-seat power as the Business Premier cabin. The newly refurbished seats are wider with a 9-inch recline and extendable leg rests with a 2-4-2 configuration on the 777 variants,  and a 2-3-2 configuration on the 787-9. Following positive reviews and high demand after its introduction, Air New Zealand re-launched its Premium Economy cabin with added business class services, including priority check-in, priority baggage handling and the same baggage allowance as Business Premier (priority baggage handling and extra baggage allowance do not apply for passengers with connecting flights to other airlines). Seat pitch is approximately 41 in (1,000 mm). 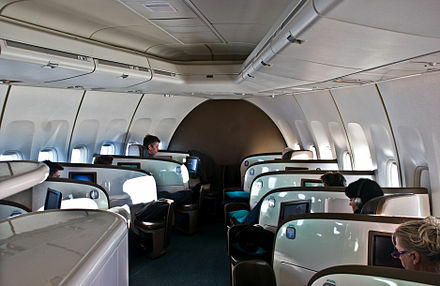 Economy class is available on all aircraft, in a 3-3-3 configuration on the 787, and a 3-4-3 configuration on the 777-200ER and the 777-300ER aircraft. The seats have a pitch of 31 to 34 inches (790 to 860 mm), have a 6-inch recline, and have a flexible edge seat base to provide more leg support when reclined. Each seat has its own AVOD entertainment system, with a 9-inch screen on the 787 and 777-200ER, and a 10.6-inch touchscreen on the 777-300ER. 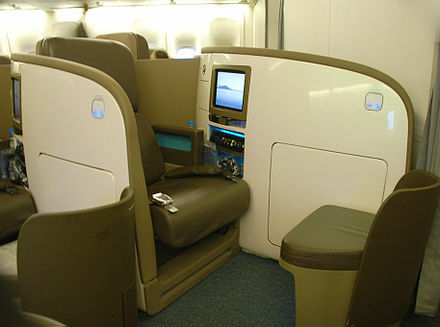 On the various aircraft, economy seats also have USB, iPod and power connections, a cup-holder and trinket tray, and a headrest designed to allow a special sleep pillow to attach to it, preventing it from slipping downwards during sleep. The Economy SkyCouch is available on the 787-9, 777-200ER and 777-300ER. It is a set of three Economy class seats on the window rows of the cabin that have armrests that retract into the seat back, and full leg rests that individually and manually can be raised to horizontal to form a flat surface extending to the back of the seats in front. It is largely designed for families for use as a flat play surface, and for couples, who on purchasing the middle seat for 25% more each, can use it as a flat sleeping surface. Each SkyCouch seat is equipped with the same basic facilities as a standard Economy seat. The Skycouch is only available on routes longer than 6 hours duration; where the aircraft are used on shorter routes, the leg rests are locked out and the Skycouch seats act as regular economy seats. Air New Zealand offers audio video on demand in all classes on international services on its aircraft. The AVOD system, branded KiaOra, features multiple channels of video, audio, music, and games. Passengers can start and stop programs, plus rewind and fast-forward as desired. 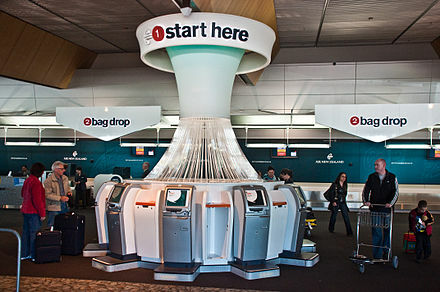 It is a gate-to-gate in-flight entertainment experience: passengers can start their entertainment as soon as they board the aircraft, and continue until they arrive at the gate of their destination, maximising play time, which is especially useful for its short-haul Tasman and Pacific Island flights. Gate-to-gate in-flight entertainment is not available on certain seats in economy (such as the bulkhead and emergency exit row seats). Seat – the basic option, consisting of a seat, one cabin bag up to 7 kg, tea, coffee and water, and AVOD entertainment including TV shows, music and games. Seat + Bag – the Seat option plus one checked bag up to 23 kg. Works – the Seat + Bag option plus movies included on AVOD entertainment, an in-flight meal, non-alcoholic and alcoholic drinks, and the ability to request a specific seat. Children receive a kids activity pack. This option is identical to the previous Economy option. Works Deluxe – the Works option plus priority check-in and baggage, and extra checked bag up to 23 kg. On the A320, passengers are guaranteed an empty middle seat next to them. On flights operated by the 777 and 787, Premium Economy replaces Works Deluxe. Air New Zealand domestic services are operated in a single class all-economy configuration. Seating forward of the over-wing emergency exits on A320 aircraft are Space+ seats, with a larger pitch between seats, but otherwise are effectively economy seats. FlexiTime – the Seat + Bag option, plus the option to request a specific seat prior to check-in (Airpoints Gold/Elite and Koru members can request a seat regardless of fare option), and the ability to change to an earlier or later flight on the same day and route for no extra cost (subject to availability). FlexiDate – the FlexiTime option, plus an extra checked bag up to 23 kg, and the ability to change a flight to a different date without a change fee (if the new flight is more expensive, the difference must be paid). 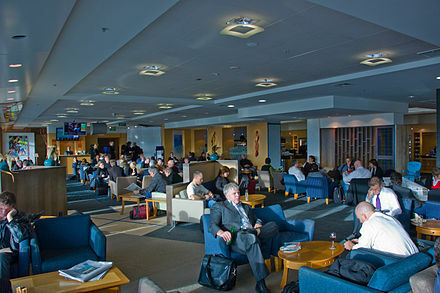 The Air New Zealand Lounge is the name for Air New Zealand's network of airline lounges around the world. Members of Air New Zealand Koru programme may access the lounges, and also get valet parking, priority wait listing, exclusive check-in, extra checked in baggage and preferred seating. Airpoints is Air New Zealand's frequent-flyer programme. Members earn Airpoints Dollars, which they can redeem at face value on any fare on Air New Zealand ticketed and operated flights. Members can attain status tiers, with increasing privileges ranging from Silver to Gold, then Gold Elite, by accumulating their Status Points, which are earned separately from Airpoints Dollars. Airpoints Gold and Airpoints Gold Elite have the same recognition as Star Alliance Gold status and benefits across the Star Alliance network. Airpoints Silver status is equivalent to Star Alliance Silver. On 19 October 2005, Air New Zealand proposed outsourcing most of its heavy maintenance on its long-haul aircraft and engines, which would result in about 600 job losses, mostly in Auckland. Air New Zealand said that there were larger maintenance providers that could provide maintenance work more cheaply due to their large scale. The proposal was estimated to save $100 million over five years and came after many attempts to attract contracts to service other airlines' longhaul aircraft. On 12 April 2006, Air New Zealand and Qantas announced that they had signed a code-share agreement for their trans-Tasman routes and would file for authorisation from the New Zealand Ministry of Transport  and the Australian Competition and Consumer Commission. The airlines maintained that they were making losses on Tasman routes due to too many empty seats, and that a codeshare would return the routes to profitability. Critics, particularly Wellington International Airport, Christchurch Airport and Melbourne Airport, argued that the codeshare would lead to reduced passenger choice and higher airfares, and that cities such as Auckland and Sydney would benefit immensely through economic activity services would bring. On 15 November 2006 Air New Zealand announced it was withdrawing its application after a draft decision by the Australian Competition and Consumer Commission to not approve the code-sharing agreement. British Airways (BA) is the flag carrier and the second largest airline in the United Kingdom based on fleet size and passengers carried, behind easyJet. The airline is based in Waterside near its main hub at London Heathrow Airport. In January 2011 BA merged with Iberia, creating the International Airlines Group (IAG), a holding company registered in Madrid, Spain. IAG is the world's third-largest airline group in terms of annual revenue and the second-largest in Europe. It is listed on the London Stock Exchange and in the FTSE 100 Index. Singapore Airlines Limited (SIA) is the flag carrier airline of Singapore with its hub at Singapore Changi Airport. The airline uses the Singapore Girl as its central figure in corporate branding. It is ranked as the world's best airline, since 2018, while winning the top spot in three other categories in the same year including "Best First Class", "Best First Class Airline Seat", and "Best Airline in Asia". In 2018, The airline was placed 18th on the top 50 most admired companies worldwide, first in Asia and the only airline on the list. All Nippon Airways Co., Ltd., also known as Zennikkū (全日空) or ANA, is the largest airline in Japan on the basis of fleet size. Its headquarters are located at Shiodome City Center in the Shiodome area of Minato, Tokyo, Japan. It operates services to both domestic and international destinations and had more than 20,000 employees as of March 2016. In May 2010, ANA's total passenger traffic was up year-on-year by 7.8%, and its international services grew by 22% to 2.07 million passengers in the first five months of 2010. ANA's main international hubs are at Narita International Airport outside Tokyo and Kansai International Airport outside Osaka. Its main domestic hubs are at Tokyo International Airport (Haneda), Osaka International Airport (Itami), Chūbu Centrair International Airport, and New Chitose Airport. EVA Air Corporation, of which "EVA" stands for Evergreen Airways, is a Taiwanese international airline based at Taoyuan International Airport near Taipei, Taiwan, operating passenger and dedicated cargo services to over 40 international destinations in Asia, Australia, Europe, and North America. EVA Air is largely privately owned and flies a fully international route network. It is a 5-star airline, rated by Skytrax. It is the second largest Taiwanese airline. EVA Air is headquartered in Luzhu, Taoyuan City, Taiwan. Qatar Airways Company Q.C.S.C., operating as Qatar Airways, is the state-owned flag carrier of Qatar. Headquartered in the Qatar Airways Tower in Doha, the airline operates a hub-and-spoke network, linking over 150 international destinations across Africa, Central Asia, Europe, Far East, South Asia, Middle East, North America, South America and Oceania from its base at Hamad International Airport, using a fleet of more than 200 aircraft. Qatar Airways Group employs more than 43,000 people. The carrier has been a member of the Oneworld alliance since October 2013, the first Gulf carrier to sign with one of the three airline alliances. Jetstar Airways Pty Ltd, trading as Jetstar, is an Australian low-cost airline headquartered in Melbourne. It is a wholly owned subsidiary of Qantas, created in response to the threat posed by low-cost airline Virgin Blue. Jetstar is part of Qantas' two brand strategy of having Qantas Airways for the premium full-service market and Jetstar for the low-cost market. Jetstar carries 8.5% of all passengers travelling in and out of Australia. Fiji Airways, is the flag carrier airline of Fiji. and operates international services to 13 countries and 23 cities including Fiji, Australia, New Zealand, Samoa, Tonga, Tuvalu, Kiribati, Vanuatu and Solomon Islands (Oceania), the United States, Hong Kong and Singapore. It has an extended network of 108 international destinations through its codeshare partners. The airline resumed direct flights to Narita, Tokyo on 3 July 2018. The Fiji Airways Group brings in 64 percent of all visitors who fly to Fiji, employs over 1000 employees, and earns revenues of over FJD$815 million. In-flight entertainment (IFE) refers to the entertainment available to aircraft passengers during a flight. In 1936, the airship Hindenburg offered passengers a piano, lounge, dining room, smoking room, and bar during the 2 1/2 day flight between Europe and America. After the Second World War, IFE was delivered in the form of food and drink services, along with an occasional projector movie during lengthy flights. In 1985 the first personal audio player was offered to passengers, along with noise cancelling headphones in 1989. During the 1990s, the demand for better IFE was a major factor in the design of aircraft cabins. Before then, the most a passenger could expect was a movie projected on a screen at the front of a cabin, which could be heard via a headphone socket at his or her seat. Now, in most aircraft, private IFE TV screens are offered. Premium economy is a travel class offered on some airlines. This travel class is positioned between standard economy class and business class in terms of price, comfort, and amenities. In 1991, EVA Air was the first to introduce Evergreen Class and had since become the first airline to offer this class of service in the world. In some ways Premium Economy has become a standard reflecting what Economy was like 40 years ago ; as an example the seat pitch of United Airlines' Economy Class was 36 inches back in the 1970s, the same seat pitch as most airlines' Premium Economy these days. The history of Air New Zealand, the national carrier of New Zealand, began when the amalgamated East Coast Airways and Cook Strait Airways began operations in January 1936 as Union Airways of N.Z. Ltd, the country's first major airline. Union Airways was the sole New Zealand aviation partner in Tasman Empire Airways Limited (TEAL), which made its inaugural flight in 1940. 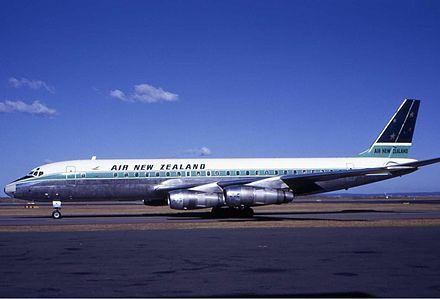 The New Zealand Government bought full ownership of TEAL in 1961 and the airline was renamed Air New Zealand in 1965. New Zealand's domestic airline, National Airways Corporation (NAC), was merged with Air New Zealand in 1978. 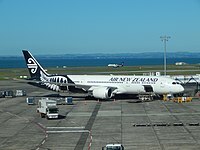 Air New Zealand was privatised in 1989 but in the early 2000s (decade) it got in financial trouble and in 2001 the New Zealand Government took up 80% ownership in return for injecting NZ$885M. In November 2013, the National Government sold down its share in Air New Zealand from 73% to 53% as part of its controversial asset sales programme. Delta Air Lines operates 900 aircraft, making it one of the largest airline fleets in the world. Before merging with Northwest Airlines in 2009, Delta Air Lines operated an all-Boeing and McDonnell Douglas fleet; it incorporated Northwest's Airbus aircraft into its fleet following the merger and subsequently ordered further Airbus types. Delta is known for its policy of generally buying older generation or used aircraft and for continuing to fly aircraft for 20-30 years, much longer than most other major airlines. As such, it has one of the oldest fleets of any American airline, with an average fleet age of 15.9 years as of 2019. Qantas is Australia's largest airline and one of the oldest airlines in the world. Qantas has gone from two fragile biplanes carrying two passengers and a pilot, to an Airbus A380 flying 450 people around the world. Qantas was founded in Winton, Queensland on 16 November 1920 as Queensland and Northern Territory Aerial Services Limited by Paul McGinness, and Hudson Fysh. Fergus McMaster joined them as Chairman, as did Arthur Baird to take care of aircraft maintenance. McGinness left QANTAS for other interests in 1922, and Hudson Fysh remained with the company as General Manager & Managing Director. He retired as Sir Hudson Fysh KBE DFC, Chairman of QANTAS in 1966. Over time, different airline companies have established a number of ultra-long haul non-stop flights. This article covers the longest flights among them. The opening of these super long routes can reduce the number of stops passengers must take to increase passenger comfort in the journey and reduce the time needed to travel between distant city pairs, although stopovers can also be rejuvenating in long distance travel. It also can help build ego and build loyalty among a set of flyers. And thus there is competition among airlines to establish the longest flight. First class is a travel class on some passenger airliners intended to be more luxurious than business class, premium economy, and economy class. On a passenger jetliner, first class usually refers to a limited number of seats or cabins toward the front of the aircraft which have more space, comfort, service, and privacy. In general, first class is the highest class offered, although some airlines have branded their new products as above first class. Propeller airliners often had first class in the rear, away from the noise of the rotating propeller, while first class on jet aircraft is normally positioned near the front of the aircraft, normally in front of the business class section, or on the top deck for aircraft such as the Boeing 747 and Airbus A380. The Air New Zealand mainline fleet consists of Boeing jet aircraft for long-haul flights, and Airbus jet aircraft for domestic- and short-haul international flights. Its two wholly owned subsidies, Mount Cook Airline and Air Nelson, operate ATR 72 and Bombardier Q300 turboprop aircraft respectively. ↑ "Air New Zealand Limited (104799) -- Companies Office". Ministry of Business, Innovation and Employment. Retrieved 7 September 2014. ↑ "Air NZ profit soars 40pc". New Zealand Herald. 27 Feb 2014. Retrieved 27 March 2014. ↑ "Airline Membership". IATA. Archived from the original on 12 October 2012. ↑ "Air New Zealand Announces New Chief Executive Officer". Scoop.co.nz. 19 June 2012. Retrieved 30 June 2013. 1 2 3 4 5 Air New Zealand Annual Financial Results 2016 (PDF) (Report). Air New Zealand. 26 August 2016. Retrieved 13 March 2017. ↑ "Air New Zealand: Facts & Figures". Star Alliance. Archived from the original on 24 November 2010. ↑ "Investor Updates" . Retrieved 23 August 2016. ↑ "Does any one airline fly all the way around the world?". Travel-nation.co.uk. Retrieved 30 June 2013. ↑ "Air NZ cuts Hong Kong-London service | The National Business Review". Nbr.co.nz. Retrieved 17 June 2013. ↑ "Directory: World Airlines". Flight International . 27 March 2007. p. 64. ↑ "We're committed to our environment Archived 14 October 2008 at the Wayback Machine ." Air New Zealand. 21 (23/29). Retrieved 26 August 2009. ↑ "Awarded ATW Airline of the Year 2010". Archived from the original on 17 May 2012. ↑ Walker, Karen (10 January 2012). "ATW names Air New Zealand 2012 Airline of the Year". Air Transport World . Retrieved 10 January 2012. ↑ "Safety Ranking 2014 » JACDEC". www.jacdec.de. Retrieved 2016-05-14. 1 2 3 4 5 6 "Air New Zealand History" (PDF). Air New Zealand. Archived from the original (PDF) on 21 June 2007. Retrieved 28 February 2007. ↑ "History - About Air New Zealand". www.airnewzealand.com.sg. Air New Zealand Singapore. Retrieved 10 December 2017. ↑ Brian Gaynor (2001-09-15). "Ambition flies in the face of reality". New Zealand Herald. ↑ Marianne Beisheim; Ernst Ulrich Von Weizsacker; Oran R. Young; Matthias Finger (2005). Limits to Privatization: How to Avoid Too Much of a Good Thing. Earthscan. p. 103. ISBN 1-84407-177-4. ↑ "Government bailout of Air NZ complete". NZ Herald. 2002-01-18. ISSN 1170-0777 . Retrieved 2018-03-12. ↑ "Air New Zealand to launch world's first route for 787-9 Dreamliner | CNN Travel". CNN Travel. 2013-11-11. Retrieved 2018-03-12. ↑ "Air NZ sells remaining stake in Virgin Australia". Scoop. 12 October 2016. Retrieved 13 March 2016. ↑ "Air NZ pulls plug on alliance with Virgin Australia". Radio New Zealand. 2018-04-05. Retrieved 2018-04-05. ↑ Bradley, Grant (12 September 2014). 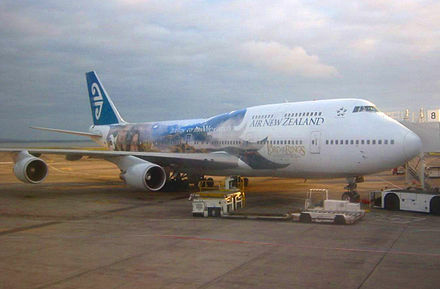 "Queen of the Skies takes her last Air NZ flight". The New Zealand Herald. Retrieved 12 September 2014. ↑ O'Sullivan, Matt (20 November 2013). "NZ government sells 20% of Air New Zealand for $324 million". The Sydney Morning Herald. Retrieved 10 December 2017. ↑ Taylor, Colin. "Big piece of Viaduct for little guys." The New Zealand Herald . Saturday 21 October 2006. Retrieved 5 March 2010. 1 2 3 Gibson, Anne. "Air NZ readies for headquarters shift." The New Zealand Herald . Monday 14 August 2006. Retrieved 26 August 2009. ↑ Pae, Peter. "Air New Zealand touts being green, quirky." Los Angeles Times . 10 October 2008. 3. Retrieved 26 August 2009. ↑ "Directory: World Airlines." Flight International . 16–22 March 2004. 70. "Quay Tower, 29 Customs Street West, Private Bag 92007, Auckland, 1020, New Zealand"
↑ "World Airline Directory." Flight International . 10 April 1969. 557. 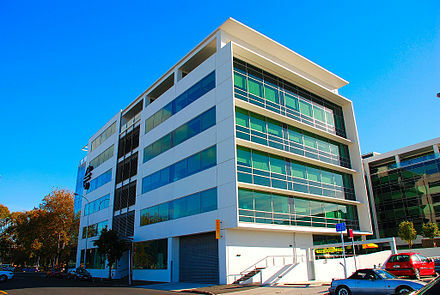 "Head Office: Airways House. 101-3 Customs Street East. Auckland. New Zealand." ↑ NZ CAA list of registered Airbus A320s. Retrieved 28 November 2008. ↑ "ZEAL 320 LIMITED (354376) Registered". 14 August 2014. ↑ "Welcome to TAE" . Retrieved 30 June 2013. ↑ van den Bergh, Roeland (22 June 2015). "Air New Zealand sells Blenheim's Safe Air to Airbus". Stuff.co.nz. Retrieved 16 July 2015. ↑ "Air New Zealand Cup". Air New Zealand. 2009. Archived from the original on 19 August 2006. ↑ "ITM Cup the new prize of national provincial rugby" (Press release). New Zealand Rugby Union. 15 March 2010. Archived from the original on 18 July 2011. Retrieved 21 May 2010. ↑ "Air New Zealand Wine Awards". Air New Zealand. 2009. Archived from the original on 16 October 2008. ↑ Antons, Christoph (2009). Traditional Knowledge, Traditional Cultural Expressions, and Intellectual Property Law in the Asia-Pacific Region. Kluwer Law International. p. 285. ISBN 9789041127211. ↑ Bruce Drum (19 November 2009). "Air New Zealand finishes removing the Pacific Wave from its Airbus A320s". Blog.seattlepi.com. Retrieved 30 June 2013. ↑ McNabb, Denise (4 May 2009). "Fyfe memo reveals Air NZ revamp". The Dominion-Post . Fairfax New Zealand . Retrieved 4 May 2009. ↑ "NEWS: Air New Zealand's Distinctive Aircraft Tails Go Black". The Flying Social Network. 20 July 2012. Archived from the original on 28 July 2012. Retrieved 17 June 2013. ↑ "Air New Zealand and Tourism New Zealand enter into new $20 million partnership". Tourism New Zealand. 11 June 2013. Archived from the original on 7 July 2013. Retrieved 17 June 2013. ↑ "Air New Zealand and Tourism New Zealand Enter Into New $20 Million Partnership". The Flying Social Network. 11 June 2013. Archived from the original on 19 June 2013. Retrieved 17 June 2013. ↑ Rendel, David G. A. (1975). Civil aviation in New Zealand: an illustrated history. Reed. p. 67. ISBN 9780589009052. ↑ "Air NZ reveals plans for black jet – nzherald.co.nz". New Zealand Herald. 22 September 2010. Retrieved 22 September 2010. ↑ "Air NZ celebrates four more years with the All Blacks". Scoop.co.nz. Air New Zealand. 21 October 2011. Retrieved 22 October 2011. ↑ Bradley, Grant (31 October 2012). "Air NZ gets the keys to new plane". The New Zealand Herald. Retrieved 1 November 2012. ↑ "Air New Zealand's Beech 1900D painted all black – flightglobal.com". Flight Global Blogs. 10 January 2012. Retrieved 14 June 2012. 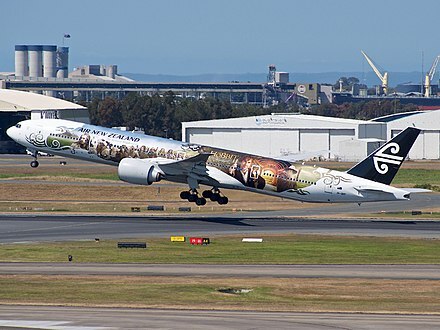 ↑ "Air New Zealand pins hopes on Hobbit payoff". Television New Zealand. 24 November 2012. Retrieved 25 November 2012. ↑ "Air New Zealand renews agreements to operate long haul Cook Islands services". Air New Zealand. 25 March 2014. Archived from the original on 14 December 2014. Retrieved 14 December 2014. ↑ "Air NZ boosts charter flights to Japan". The New Zealand Herald. ↑ "Profile on Air New Zealand". CAPA. Centre for Aviation. Archived from the original on 2016-10-31. Retrieved 2016-10-31. ↑ "EVA Air and Air New Zealand sign codeshare agreement – Blue Swan Daily". blueswandaily.com. Retrieved 5 November 2018. ↑ "Qantas, Air New Zealand announce codesharing partnership". news.com.au. 1 June 2018. Retrieved 2 June 2018. 1 2 "Operating Fleet". Air New Zealand. 31 January 2019. Retrieved 23 February 2019. ↑ "Air New Zealand welcomes arrival of first premium heavy 787-9". Australian Aviation. Retrieved 11 October 2017. ↑ "Air New Zealand Business Class Seats review". waytofly.com. ↑ "Air New Zealand 777-300" . Retrieved 20 January 2012. ↑ "Air New Zealand 777 seat map". Airrreview. Retrieved 30 September 2016. ↑ "Economy SkyCouch – Air New Zealand". Archived from the original on 5 December 2010. Retrieved 12 November 2010. 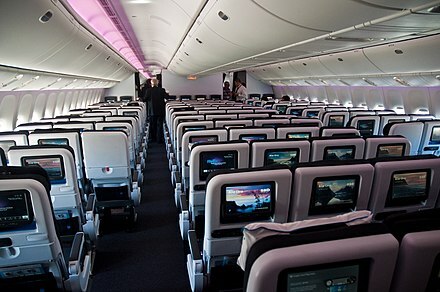 ↑ "Seat features – Economy SkyCouch – Air New Zealand: Future Taking Flight" . Retrieved 12 November 2010. ↑ Slade, Maria (27 January 2010). "Welcome to cuddle class". The New Zealand Herald. Retrieved 12 November 2010. ↑ "Airlines to introduce 'cuddle class'". news.com.au. 11 October 2010. Archived from the original on 20 October 2010. Retrieved 12 November 2010. ↑ Gordon, Sarah (26 January 2010). "From 'cattle' to 'cuddle' class: Air New Zealand offers beds in economy". The Daily Mail. London. Archived from the original on 5 November 2010. Retrieved 12 November 2010. ↑ "Air New Zealand's 'cuddle class' raises 'mile high' concerns". One India News. 1 February 2010. Retrieved 12 November 2010. ↑ The Economy SkyCouch Activity Guide at Air New Zealand's official Facebook page. Retrieved 12 November 2010. ↑ "In-flight Entertainment". Air New Zealand. ↑ "Air New Zealand Inflight magazine" . Retrieved 20 January 2012. 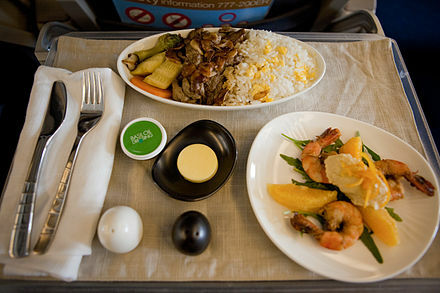 ↑ "Air New Zealand Inflight food menu" . Retrieved 20 January 2012. ↑ "The choice is all yours: New Tasman and Pacific service – Air New Zealand". Archived from the original on 5 December 2010. Retrieved 10 November 2010. ↑ "Air New Zealand overview" . Retrieved 20 January 2012. ↑ "Air New Zealand Space+ seat" . Retrieved 20 January 2012. ↑ "Air NZ Status Points". Air New Zealand. 2009. Archived from the original on 10 February 2009. Retrieved 24 August 2009. ↑ "Air NZ engineers accept deal". The New Zealand Herald. 24 February 2006. ↑ "Airline Bars Men From Lone Children". peterellis.org.nz. 29 November 2009. Retrieved 31 July 2010. ↑ Thomson, Ainsley (29 November 2005). "Ban on men sitting next to children". The New Zealand Herald. Retrieved 31 July 2010. ↑ "Qantas Airways Ltd & Air New Zealand Ltd – Authorisations". Accc.gov.au. Archived from the original on 8 May 2007. Retrieved 30 June 2013. ↑ QANTAS. "Announced: From October 2018 Qantas customers will enjoy seamless travel in New Zealand through our new @FlyAirNZ domestic codeshare agreement". Twitter. Retrieved 2018-06-02. ↑ "Air NZ sees biofuel salvation in jatropha". Carbonpositive.net. 6 June 2008. Archived from the original on 11 December 2008. Retrieved 31 July 2010. ↑ "Vegetable oil tested on NZ flight". BBC News. 31 December 2008. Archived from the original on 31 December 2008. Retrieved 31 December 2008.